This is an advanced version of the easy magic trick, the "Jumping Rubberband." This version uses two rubberbands, one that switches places between your fingers and the second that appears to block it. Learn the Jumping Rubberband by watching our video here. For more video magic lessons, please subscribe to our video channel. Effect: Even though you’ve wrapped a rubberband around the tips of your fingers, a second rubberband quickly and mysteriously jumps from your pinkie and ring fingers to the first and middle fingers of the same hand. Materials: Two rubberbands of different colors. If you like, you can also use hair bands. Hold your hand naturally and wrap one rubberband around your pinkie and ring fingers. Let the rubber band rest at the base of your fingers. The back of your hand should be facing your audience. Loop the second rubberband around the top of your little finger. Twist the second rubberband back and forth to loop it around the tips of the fingers. Continue looping until you’ve encased all four fingers. This image shows the second rubberband completely looped around the tips of the fingers. Setup the jumping rubberband as in the basic trick. If you don’t know how to do this, please learn the jumping rubberband by clicking here. This image shows the audience’s view when the trick is setup and ready to go. 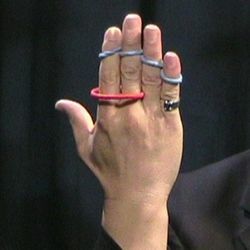 By simply opening your hand, the rubberband jumps from one set of fingers to the other, even while seemingly blocked by the second band. If you like, you can reverse the steps and make the rubberband jump back. You can learn another version of this trick by clicking here.